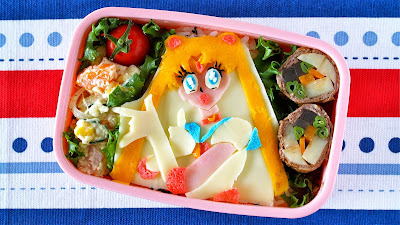 Sailor Moon is coming back in July, so I received many requests for a Kyaraben (Character Bento) recipe. 1. Dilute each gel color with a little milk (or water) to give a thin consistency. 1. Beat egg yolk in a small bowl and season it with a bit of salt. 1. With a permanent marker (Sharpie), trace your favorite Sailor Moon illustration on the parchment paper and cut all parts into pieces. 2. Place the stencil pieces on the egg crepes, sliced cheese and sliced ham, then cut them out using a design knife. Cut out Nori seaweed sheet to make her eye lashes and nose. 3. Use a bit of mayonnaise to attach the cutouts onto a sliced cheese. 4. Put cooked rice in a bento box. Then top with some rice seasoning of your choice and place the decorated cheese on top. 5. Arrange with side dishes.